A: Good thinking! A bathroom ventilation fan will definitely reduce the humidity caused by bathing and showering, and it will protect your bathroom from moisture damage in the long run. If you haven’t shopped for a ventilation fan recently, you’ll probably be pleasantly surprised at how far the technology has come. Early models took an inefficient, one-size-fits-all approach, creating more circulation (and noise) than was necessary in small bathrooms and not enough circulation in large bathrooms. Fortunately, manufacturers have spent the past 15 years focusing on producing highly efficient fans designed to suit bathrooms of specific sizes. Today’s fans are very effective at removing steamy air, and they no longer sound like jets on the runway. To navigate the newer options, we have Daniel O’Brian, technical expert with us at SupplyHouse.com. With his help, we’ve pinpointed the key considerations when you’re sizing up your bathroom’s needs. First things first: A bathroom fan’s size refers not so much to the fan’s dimensions as it does to its power, or how much air the fan can move. To determine the correct CFM, calculate the area of your bathroom. 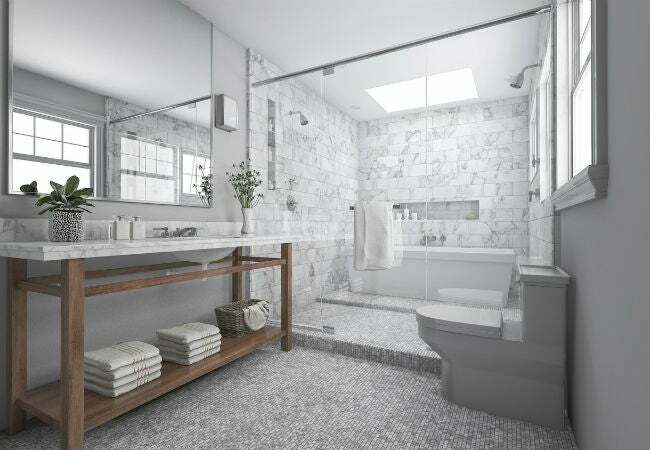 To get the total square footage, multiply the length of your bathroom by its width. A fan’s power is measured in “cubic” feet per minute, so you might think that the next step would be to calculate the volume of the room by multiplying the area by the ceiling height. But O’Brian suggests a simpler rule of thumb: For bathrooms less than 100 square feet, “You can just go with 1 CFM for every square foot of floor area,” he says. For example, if your bathroom is 80 square feet, you’ll need an 80 CFM fan, such as the Broan SmartSense 80 CFM Ventilation Fan. Look for more power if your bathroom has high ceilings. So, for an 80-square-foot bathroom with a 10-foot ceiling, you’ll get the best results from a fan with a rating of at least 112 CFM. Coming in at 115 CFM, the Broan L100MG Ventilation Fan delivers. As you probably won’t need to run this larger fan at full power every time you enter the bathroom, consider pairing it with a variable speed control. This separate feature enables you to adjust the fan speed to suit your needs, so you can turn it down when shaving in the morning and turn it all the way up for a steamy shower. In large master bathrooms, you can find the desired CFM through simple addition. A large bathroom with a jetted tub, a toilet, and a shower—a common configuration in new homes—would need a 200 CFM ventilation fan, such as the Broan L200 Ventilation Fan. If you can’t find a fan with the exact CFM your equation produces, purchase one with a slightly higher CFM. “It doesn’t hurt to go a little over to be safe,” O’Brian says. If you have an enclosed shower area or a toilet stall, you’ll need an additional fan. “Enclosed” means that there’s a privacy wall running from floor to ceiling and a door that closes completely. (Note that a separate fan would not be needed for a shower door that doesn’t reach the ceiling.) These small enclosed stalls are popular for ensuring privacy in large bathrooms that boast open access to walk-in closets. The floor-to-ceiling walls prevent air from circulating to an enclosed shower or toilet no matter the size of the fan in the main part of the bathroom, so it’s best to install an additional small ventilation fan in the enclosed area. A 50 CFM fan is usually sufficient. Look for something like the Air King ASLC50 Ventilation Fan, which includes a light so it can take the place of a regular overhead light. Note that when choosing a fan to install directly over a shower, the fan should be rated for installation in wet areas and should be connected to a GFCI outlet or breaker. Don’t undersize your fan just because you’re looking for less noise. 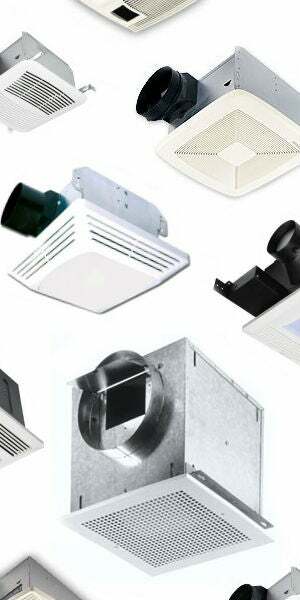 When it comes to bathroom ventilation fans, more power doesn’t necessarily mean more noise. The amount of noise a fan makes when it’s operating is rated in units of measurement called sones; the higher the sone rating, the louder the unit. Bathroom fans are rated from 0.3 to 4 sones, with 4 being the noisiest, “comparable to the sound of a television,” O’Brian offers. A sone rating of 1, on the other hand, is similar to the gentle hum of a refrigerator. A rating of less than 1 will be so quiet you may not even notice that the fan is operating! If you’re looking for a very quiet fan, consider something like S&P’s Premium Choice Ventilation Fan, which features a variable speed of 80 to 150 CFM and a sone rating of just 0.3 on its quietest setting. Replacing your existing light with a fan/light combo makes for easier installation. In older homes without bathroom ventilation, a fan/light combo like the 80 CFM Fantech FQ Series Quiet Ventilation Fan can be installed in place of an existing ceiling light to keep from having to install a separate fan. The Fantech not only offers a very quiet 0.4 sones, but it also comes with both an overhead light and a night light that can be wired to switch on individually. Fan/light combos with night lights are very popular because they allow nocturnal bathroom users to navigate the room without having to turn on a harsh overhead light. Say goodbye to boring bathroom fans. Today’s ventilation fans not only whisk away steamy shower air, they multitask to make your morning ritual more enjoyable. After figuring out how much power you need in a vent fan, ask yourself if you could benefit from some additional options. If your bathroom is chilly first thing in the morning, you’ll love the toasty-warm air emitted by the Broan QTX110HL Ultra Silent Heater Fan and Light Combo. To satisfy the techie-geek in all of us, O’Brian notes that “some fans now come with a built-in Bluetooth speaker! Connect your phone and play whatever you want from your fan.” If that sounds like something you’d enjoy, consider the Broan Sensonic Speaker Fan with Wireless Bluetooth. Check out this video to see why—once you’ve installed the Broan Sensonic—your morning routine will never be the same!